Two digitally controlled preamps provide individually switchable 48V phantom power. These brand new circuits feature gain of up to 70 dB, adjustable in steps of 3 dB, plus a relay-driven PAD, resulting in exceptional EIN (Equivalent Input Noise) performance as well as line overload protection, and enough gain for even the lowest level microphones. Babyface Pro's incredibly efficient design almost never requires an external power supply – it's perfectly stable on USB 3 bus power, and also most USB 2 ports, with no degradation in any technical specification. This makes it perfect for mobile recording, even with a pair of your favourite condenser microphones. The comprehensive feature set continues with an optical TOSLINK I/O; use as either an ADAT port with SMUX support or SPDIF for sessions up to 192 kHz. In combination with an external ADAT converter, the Babyface Pro fully supports 12 analogue inputs as well as 12 outputs, making it ideal for both live and studio multi-track applications. You can plug any instrument, line or high impedance, into Babyface Pro's jack inputs 3 & 4. Record your guitar on the go, with no additional hardware required. MIDI I/O via an included breakout cable completes the package. The FPGA-based DSP mixer adds a flexible, 3-band parametric equaliser to all inputs and outputs. Reverb and delay FX are also onboard. This high-end interface incorporates newly designed analogue and digital circuits. Its innovative energy saving technologies provide supreme fidelity with no compromises in level, noise or distortion. The Class Compliant mode is a standard that is natively supported by operating systems like Windows, Mac OS X, Linux distributions, and hardware like Apple's iPad. No proprietary drivers are required, the device will be directly recognised. 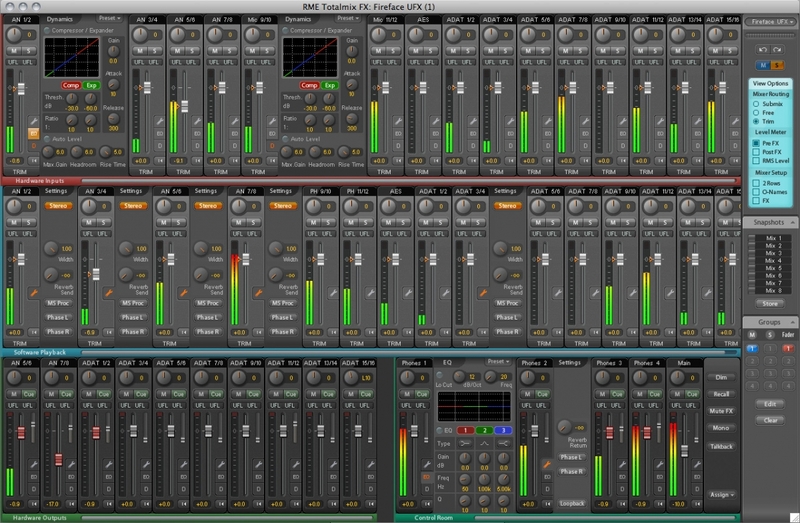 TotalMix FX is RME's superior hardware mixer. It delivers fully flexible mixing/routing with many superior features for studio and live work, still maintaining exemplary overview and usability.